Whether you sleep on your side, snooze on your stomach, sack out on your back, or a combination of everything, we all sleep in different positions. Choosing the right pillow can make the difference between a good night’s sleep and waking up tired with aches and pains. Those of us who sleep on our back have specific needs in a pillow to properly support our heads and keep our spines aligned. This review guide makes it easy for you to find the perfect back sleeper pillow. You deserve to wake up feeling rested and rejuvenated. The big, box stores often have cheaper alternatives. But, let’s face it, cheap is not always inexpensive. A lousy pillow can cause you pain, sleepless nights, and even a visit to the doctor’s office. Everybody sleeps, but people who have a proper pillow sleep well and feel better. 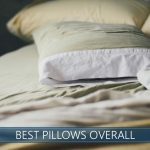 It can be challenging to know which one will work best for you, but we researched a diverse set of pillows that are the most highly rated by customers for comfort and support. All of them come in different shapes, sizes, firmness levels, and are made with various materials. This list should help you find the pillow that is just right for you. People who sleep on their back tend to use a pillow that is too soft or flat. Without the right shape or support, your spine becomes poorly aligned, or you might feel a “crick in your neck.” Choosing the appropriate pillow is essential, and there are many things to consider. Loft (not the apartment) in a cushion is a crucial factor because it is the measurement of how fluffy or tall the pillow is. Still, a big, fluffy pillow without support can become flat and uncomfortable. That’s why you need to consider firmness. Unlike stomach sleepers, you will want to choose a firmer pillow that will provide proper support for your head and neck. A back sleeper pillow that is too flat or too soft can make your sleep painful. Don’t you love the fresh feeling against your cheek? If you are one of those people, who get hot at night, finding a pillow that keeps you cool will be a priority for you. Some manufacturers have gone to great lengths to ensure that the materials are breathable and that they provide adequate heat distribution, so you can rest without feeling hot. A dependable staple material for bedding. A new material to the market, memory foam is known to keep its shape. A natural material, cotton is a standard product. Look for higher thread count to insure softness. Another natural product that is new for western markets. Bamboo provides a firm, but shapeable feel. We’ve all become accustomed to the standard shape: a nice, fluffy rectangle. Well, advancements have brought us some contemporary designs. If bedding aesthetics are important to you, this may be a consideration. Many of the memory foam and polyurethane models have a solid form, and you can’t mush them around as you do with worn-out pillows. They come in a form that cannot be changed. Yet, some brands can be fluffed and formed. The biggest advantage of memory foam is that it keeps its shape, but that can be its biggest downfall. Some manufacturers overcome this by shredding the memory foam. Gel fiber fill is similar and can also be manipulated in different ways. By adding zippers in pillows, some manufacturers allow you to adjust the amount of fill according to your preferences. Higher loft or lower loft, you get to decide. Mornings can be awful after a bad night’s sleep. Studies show that too little sleep cuts down your productivity. Guzzling coffee to try to stay awake even when you get your average amount of sleep may indicate that your sleep quality is diminished. Choosing a pillow designed for a back sleeper can be an affordable solution, especially if you are feeling pain in your spine. Old bedding can collect dust mites, which are a disaster if you are allergic to them. If your pillow is old or is a low-quality product, it’s time to replace it. Whether the materials are natural or synthetic, improvements in how new pillows are assembled make now the best time to buy one. With ergonomics and comfort in mind, new designs will amaze you. You’ll want to experience the new levels of relaxation. You can put that old pillow into the washer. When you pull it out, try hard to reshape it. If you put it in the dryer, the chances are that it may fall apart. Many of the products we researched are machine washable, or they have a removable covering that can be. A fresh pillow is a beautiful thing to lay your head upon at bedtime. The Classic Brands Cool Sleep pillow offers an infused cooling gel memory foam core, which distributes the heat away from the sleeper. Its high loft creates a firm comfort, while its “cool pass fiber” insures that the sleeper will have a moisture-free night. The core, which is made of memory foam that is ventilated and infused with a cooling gel (see more cooling pillows), makes for a comfortable sleeping temperature. This pillow is designed specifically with back and side sleepers in mind. Its shape is rectangular, but this is great because most people who sleep on their back also rest their shoulders on the pillow, as well. Consider yourself more of a side sleeper? Read our pillow guide designed for side sleepers. Most buyers love that it provides much-needed support without being too hard. Some people who have tried similar pillows rave about the Classic Brands Cool Sleep, as it alleviated aches and pains. A lot of folks claim this is their favorite pillow ever! Unfortunately, shrink-wrapping, packing and shipping do not allow the pillow to breathe, so buyers are often met with an unpleasant chemical smell upon opening. However, given enough time to air out, the odor dissipates, and it is fine for use. Buyers just love them, with thousands of positive reviews online. You’ve seen the commercial while leaning on your limp, squishy pillow as you watched late night TV. Now, you’ll want one in your home just for you! Manufactured in Minnesota, this American beauty offers a 10-year warranty and a 60-day money back guarantee. You can be assured that you can find a pillow that fits your needs with a sizing guide that uses your t-shirt size to guide you to the proper loft level. You can now own the perfect My Pillow just for you. One customer was excited that he didn’t have to stack his it with others. As a larger person, he had struggled to find one that was tall and firm enough for his needs. Who can resist this product that is quickly becoming a part of Americana? When it arrives, you must fluff this pillow up by putting it into the dryer for 15 minutes to get it to its full size. Some customers found the contents of the pillow to be a bit lumpy. However, many customers state that it was excellent for their arthritis and other pains and that they love the texture. Have you ever gone on a posh vacation and fell in love with the luxurious pillow in your hotel? 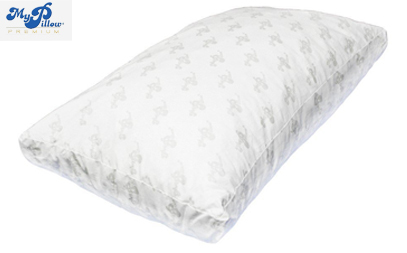 The chances are that the pillow you slept on was a Sahara Nights Pillow. If you haven’t tried one, you simply must! 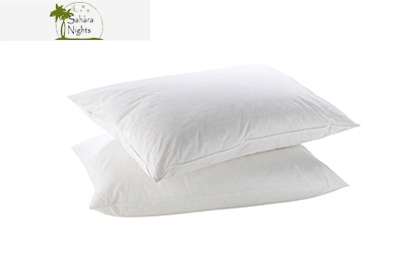 Most buyers report that they just had to have a Sahara Nights Pillow after sleeping on one while on a trip. Some wouldn’t leave the hotel without one, or two or three or four, to take home! While being just the right amount of firmness, it’s shape is that of the standard pillow you would expect, so it looks beautiful on a bed. Along with the comfort, you will love the cotton, hypoallergenic material, with a gel fiber fill that gives it the feel of a down pillow. A restful night’s sleep awaits the owner of this gem! Buyers gush about this wonderful product that hotels have been keeping a secret. With just the right amount of firmness, it is very soft, plush, and indulgent. 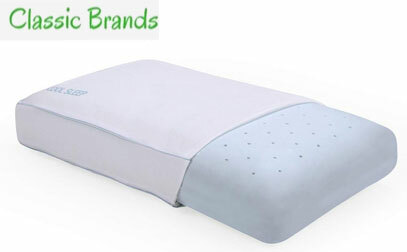 Some customers who prefer a very firm pillow express that this brand is too soft for them. But, everyone agrees that it is a wonderfully supple, sumptuous pillow, that provides excellent support while you snooze like royalty. It comes in four choices: Queen, Queen Firm, King, and King Firm. Customers were amazed by the many options they had in adjusting this pillow. The neck roll creates unlimited possibilities for fitting your specific neck preference and can roll into a pocket in the middle of one side. The memory cluster fiber that is found on either side of the neck roll can be adjusted by removing it: storing it in a plastic zip bag, for use later if needed is a great idea. The biggest difficulty buyers faced was getting the stuffing and neck roll to suit them just right, but most found the correct combination after a few tries. It is a good idea to experiment until you get that just-right fit. It makes an excellent choice for all those who need to customize the shape and loft for their individual neck and back needs. 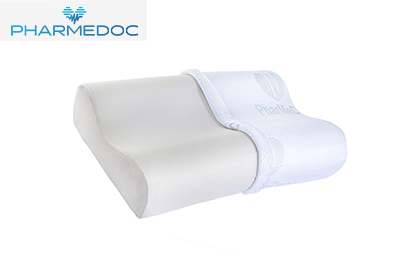 An affordable choice, the PharMeDoc Contour pillow has a classic design that you expect from a product that can help with back ailments. A curved shape, 5 inches on one end and 4 inches on the other end, with a gentle slope in the center, it gives its users choices. The core is made of memory foam and has a removable, washable cover, and has a lifetime manufacturer’s warranty and 100% satisfaction guaranteed. The product appeals to customers who prefer a firmer rest for their head and who may struggle with tossing and turning. Aligning the neck to create the correct spinal configuration, the PharMeDoc pleases many buyers who especially at risk of spinal pain. 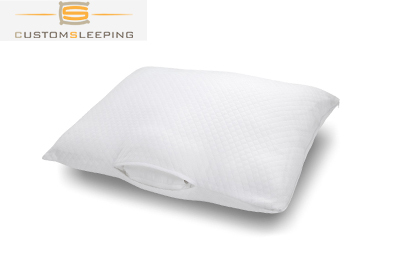 The memory foam feels soft while providing a strongly supportive pillow. It will not be suitable for back sleepers who sometimes roll over to their stomach. However, it is designed to lessen tossing and turning. Some customers reported a period of adjustment was necessary for them to get accustomed to the firmness level. However, many say that they have enjoyed fewer backaches and neck difficulties after sleeping on it for a few nights. Another thrifty choice, The IshowStore Therapeutic and Ergonomic brand lives up to its name by providing a butterfly-shaped pillow that is not only comfortable, but helps heal your back while you sleep. Made with memory foam, it helps with snoring, head and neck pains, insomnia, and many other issues. Its shape is low and straight on one side, while the other has raised sides with a concave area in the center for your head. Those who purchased this very affordable pillow enjoyed the firmness and its ability to keep its shape without going flat. It has corrective properties, specifically for people who suffer from back troubles. A 100% polyurethane product, the memory foam is also anti-bacterial, dust mite-resistant, and comes with a removable, washable pillowcase. Some buyers found the multiple heights of the loft confusing. With those many choices, each sleeper can find a preferable height, suitable just for them. It comes in several different colors: white, navy blue, grey, and purple. This unique pillow is a wonderful alternative for folks who don’t want a memory foam or the old, standard kind of pillow they have always had. 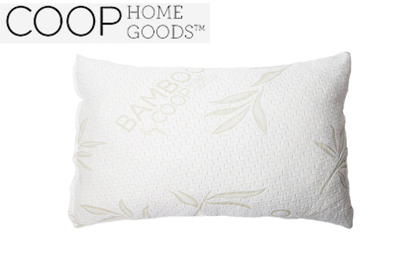 Made of 40% Bamboo and 60% Polyester, it is pliable and great for the back sleeper who likes to mold their pillow into just the perfect shape for them. With a removable and washable bamboo pillow case, it will shape into your favorite height for hours of peaceful slumber. Buyers who didn’t want a molded option that does not change shape, but wanted a firm pillow that they could conform to different shapes, praised the merits of this pillow. One of its unique features is its flexibility while remaining firm, and having a classic pillow shape. Some buyers sleep with one pillow under their head while using another as a body pillow. You can expect it to arrive shrink-wrapped, which means it may have a slight odor, and it will need time to expand and breathe. While back sleepers enjoyed this product immensely, stomach sleepers found its loft too high, so if you tend to toss and turn, this may not be a good choice for you. Still, many buyers report that this pillow has helped ease pain and increase sleep. When you think of how often and for how long you use a cushion, it makes sense to invest in a good one. Eight hours is a long time to be uncomfortable, but it is wonderful to wake up well-rested. Treat yourself to a pillow that will give you a soothing slumber. Remember when choosing your pillow, you need a firm pillow that still feels soft and inviting at the end of the day. If you choose a molded form pillow, coolness is going to be especially important to you. Ones with a non-descript shape can be fluffed, but sometimes lacks the firmness back sleepers need. The Classic Brands Cool Sleep is our top-rated choice for that reason. It is firm, yet has just enough softness to be inviting. With its innovative materials that will keep you cool at night, it’s sure to become your favorite as well. Thank you for sharing different options of pillow for back sleepers. I know this will be helpful for me and to other people who sleep on their back. I know that these pillows will help us ease the pain we suffer after a night of sleeping without the proper pillow.